I’ve now read quite a lot about this book, enough to know that I would really enjoy it. But somehow, I’ve never managed to get my hands on it. Thank you for such a comprehensive and thoughtful review. It does sound like Jean Rhys… one for the wishlist! Great. It’s not quite as bleak or tragic as some of Rhys’ stories, but even so it does has several moments of darkness. The balance between light and shade is very effective. Definitely Rhys territory except that Rhys’s characters don’t get to be the heroes of their own lives the way Keun’s do. From what I’ve read about her other novels, I get the impression that Keun’s protagonists have more agency than Rhys’ – a stronger will to survive, perhaps? Super commentary as always Jacqui. this sounds very good. I read Keun’s After Midnight which I found to be excellent. That also featured a young woman as protagonist whose voice was vivacious and genuine. I would like to read more books from this author so I should move on to this one. Thanks, Brian. I must have missed your review of After Midnight when it came out – I’ll take another look later. It sounds as if strong female protagonists were Keun’s speciality. The narrative voice here was very compelling – so engaging and yet heartbreaking too. This sounds pretty amazing, Jacqui, as does Keun’s After Midnight. I’m ashamed to admit I’ve never heard of the autrhor before. One to sus out . . .
I’m attracted to all things Berlin so was already predisposed to want this but you clinched it with your mention of Summer Before Dark which I found fascinating. Great review, as ever, Jacqui. Ah – thanks, Susan. Berlin is such a fascinating city, isn’t it? Like you, I’m attracted to stories that are set there, especially when they hark back to this particular period in time – it’s probably my favourite era. I listened to the audio version of Summer Before the Dark when it featured on Radio 4’s Book of the Week last year – a very poignant listening experience particularly towards the end. One of my favourite European cities, and all praise to Pushkin Press for Summer… They have a sharp editorial eye! They do indeed. Probably one of the few publishers I would buy from without the benefit of reviews. Thanks for the link, Jacqui. And thank you for reminding me that I really have to read more by Irmgard Keun. This is the first I’m hearing of this book, but it will be the next one of Keun’s book I’ll read. I am so intrigued after your review! You’re very welcome. Thank you for helping to encourage me to read Keun in the first place. I’m so glad I finally got around to her! I’d love to hear how you think this compares to her other novels. Which one would you suggest I try next, Gilgi or After Midnight (assuming you’ve read both)? Looks like After Midnight is going to be horrendously hard to get hold of in paperback over here, so I might have to go down the kindle route if I plump for that one. I have only read After Midnight, so I can’t say which one to read next. I’m sure you’ll enjoy both. Have you tried Abe Books? Sometimes, you can find great deals on harder-to-get books there, although shipping charges might make it expensive. Ah, I couldn’t recall if you’d read Gilgi! Yes, you’re right – I’m fairly sure I would enjoy both. Abe is a good suggestion, thanks. I’ll take a look at their site. Wonderful review, I remember Karen reviewing this. Having read Goodbye Berlin I think I would enjoy this too. I does sound like a great companion piece. Thanks, Ali. There’s a very good chance you’d like this. If I remember rightly, Karen likened Doris to Flammchen from Vicki Baum’s Grand Hotel. That’s not a bad reference point, especially for the early section of the novel which is a little lighter in tone than much of the Berlin segment. Excellent review as always Jacqui. And I agree that the darker elements of the book place this much closer to Isherwood or Rhys than to Loos. Keun was a fascinating character and the books I’ve read by her have been very rewarding. I’m fascinated by this era and setting too, the dying days of the Weimer Republic. I can’t recall if you’ve read Christopher Isherwood’s Berlin novels? But if you have and you liked them, chances are you’d enjoy this too. I have this one of the shelf, Jacqui. Like you, I’m fascinated by this ear. Have you heard of ANita Berber by chance? I think it’s the mix of horror and decadence that fascinates me, the sense that everything was done to excess. No, I hadn’t heard of Anita Berber. I just looked her up on wiki – it sounds as if she lived quite a life! Glad you enjoyed, Jacqui. Keun is wonderful. I wrote about After Midnight at my blog for German Lit Month last year. Recently I’ve been reading Jason Lutes’s Berlin comics. Do you know them? Set in the late 20s, early 30s. I think you would really like them. Ah – apologies, Dorian. Please feel free to add a link to your review of After Midnight. I’ll drop by a little later to take another look. Delighted to hear you are a fan of her work! I think you’d like the comics. Yes, very interested – thanks. I’ll be along very shortly. Was the third of the Lutes’ ever published do you know? I have the first two but hadn’t started them as I thought I’d wait for the promised third, but if it’s not coming out I may as well read those I have. Not yet I don’t think. But I was on the Drawn & Quarterly site recently and the individual installments still seem to be coming out (although the pace has slowed a lot). So I think Vol 3 will be published eventually. I think they are pretty amazing. So beautifully drawn and really informative about a period I just can’t seem to get enough of. Yes, it’s interesting to reflect on how quickly the atmosphere must have changed during the years that followed. Quite a contrast with the decadence and openness of the late ’20s/early 30s. I think you’d like this one, Stu. It’s very engaging and compelling. On the strength of this, I would have no hesitation in recommending her. I read this and her After Midnight for German Literature Month in 2015. Thanks for mentioning Jean Rhys, I see it for sure now. In my conclusion on this novel I said. 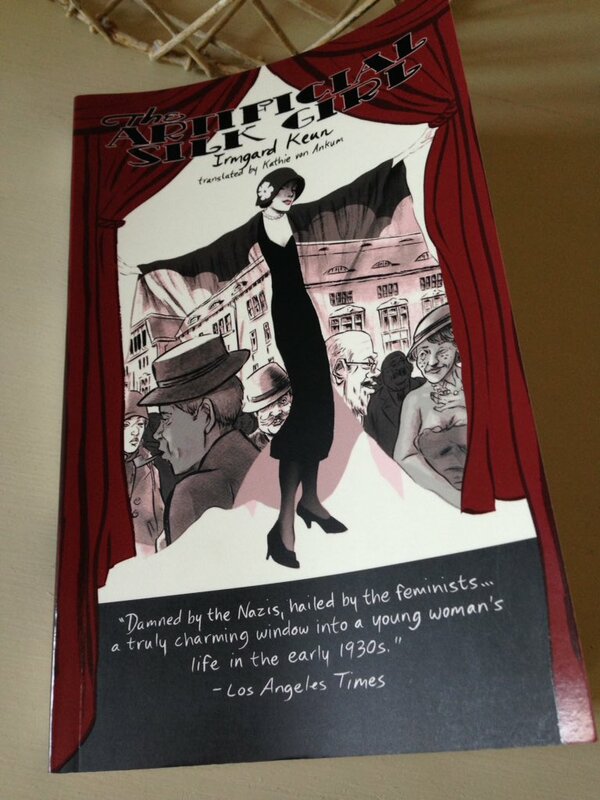 The Artificial Silk Girl is not a “heavy read” like The Death of Virgil or a work of genius like We all Die Alone by Hans Fallada but for sure it gave me a feel of what it must have been like to be broke, young, female, pretty and without a family or any real friends in the early days of Nazi Germany. Slowly it becomes a city of whores, johns, pimps and assorted passeers by on Alexanderplatz. Thanks, Mel. It’s very effective in that respect – you really get a feel for the sense of loneliness and despair in Doris’ life as she tries to get by from one day to the next. Keun’s portrayal of the city is incredibly evocative too, very much in line with the view Christopher Isherwood puts forward in Goodbye to Berlin (especially in the closing chapters where the atmosphere seems to turn darker by the day). After Midnight sounds like the one to go for – I think you’re the fourth reader to recommend it! I shall have to seek it out. I’ve long had this on a wishlist, though on kindle for some reason. How is the book as a physical book? The quotes are excellent, which doesn’t surprise me. She stood out to me in Summer Before the Dark where she was (very briefly) quoted and her language just sang from the page. Interesting to see the Jean Rhys comparisons too. I can definitely see it in that last quote. Very nice piece Jacqui! I’m pleased to hear that you’ve already got it on a wishlist – it’s definitely a book I would recommend to you, no doubt about it. Yes, I recall you highlighting that line in your review of Summer Before the Dark, the one about her skin saying ‘yes’ to Joseph Roth. It’s a great quote, very striking indeed. I love the prose in this, it’s so engaging. It can be hard to strike the right note with a first-person narrative, but everything feels so refreshingly natural here, not in the least bit contrived. The book itself is lovely, beautifully produced by Other Press (attractive cover, good quality paper etc. ), I’m glad I managed to find a reasonably priced copy in the end. It’s worth looking around for one. The similarities with Rhys really hit home in the second half of the novel. The way that Doris becomes so dependent on the passing fancies of men reminds me very much of the women in those early stories by Rhys. Well, that and the protagonist’s fascination with clothes, another parallel with Rhys’ heroines. Also, the feeling that the conventional roles of wife and mother were just not for them, they weren’t cut out for that kind of life. (Doris has more get-up-and-go than Anna from Voyage in the Dark. So, you get the sense that Doris could hack it in the traditional workplace if she put her mind to it whereas Anna would almost certainly drown. That said, the similarities are there in the broad themes these writers are addressing i.e. society’s view of women and the expectation that they should conform.) It’s interesting to note that Keun and Rhys were writing at broadly the same time. I wonder if they were aware of one another? Thanks fir participating, Jacqui. It’s a wonderful review of a book I loved when I read it. Actually at about the same time as Rhys. I can’t see any similarities at all but that probably because I read the Keun in German and the tone is very different. Her voice is so strong and unique and flavorful. Not sure that came through in English. I need to get back to her some day. Hi Jacqui! I have just discovered your blog and I enjoyed reading this post. I love first-person narration and this book sounds like it will work for me. Thank you! You’re very welcome, Deepika. I’m glad you like the sound of this. It’s a great book, especially if you like first-person narratives – Doris’ voice is very engaging. I hope you get a chance to read it one day. Thanks for the link. It’s interesting you mention the narrative voice – this is something Keun does extremely well, perhaps one reason she makes you think of Rhys. The voice seems to immerse us immediately in the time and place because her characters live in the moment – often because they have to. You’re very welcome. Thanks for encouraging me to give her a try – your post was very instrumental in that respect! Yes, there’s definitely a sense of Doris living in the moment in this one. She just takes every day as it comes without really knowing what it might bring. It’s terrific, Tony. I’d definitely recommend it. Have you read any of her others? Jacqui – Sadly not, but I’m sure I’ll get around to one in due course. This sounds like an interesting read, bittersweet with a veneer of charm that, perhaps, masks its more serious undertones. I can understand from the quotations why you would make the association with Rhys. The character seems bitter but insightful, cutting in some ways, but perhaps not as despairful as one of Rhys’s characters. Interesting review Jacqui. Thanks, Belinda. Yes, it’s much darker than it appears at first sight. Not quite as bleak as Rhys, but even so it has its moments. It’s interesting how both of these writers gave a voice to a certain type of experience, one not often featured in literature at the time. They seemed ahead of their time in that respect. As I was reading your review I was reminded of Jean Rhys, so it was interesting to see that was the parallel you found! It sounds great, and I so much enjoy Rhys, I’ll definitely look out for this. Doris’ situation is very reminiscent of Rhys, as are elements of her voice and her fascination with clothes. I think you’d like this one a lot. Strangely, I’ve never read Rhys, only read reviews of her books but this story reminded me of the one by Rhys with a young girl in Paris, taking lovers to support her and trying hard to survive in the big city. And they you mentioned her. The Artificial Silk is not availble in French. Translation tragedy. That is a tragedy – we’ll have to hope it gets translated one day! The comparison with Rhys is very striking, especially in terms of Doris’ position and reliance on men. I couldn’t help but think of one of those early ‘Paris’ novels where the heroine drifts around the city stumbling from one lover to another just in an effort to get by. Doris has a bit more get-up-and-go than Rhys’ protagonists (she’s less dispirited or disillusioned) – even so, the parallels are there.